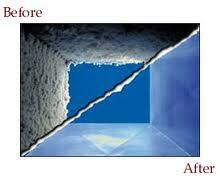 Sandium Heating and Air Blog: Are Your Ducts Clean? The above unit shows a very dirty coil which caused the unit to not cool efficiently. A good coil cleaning solution got it back to it's intended cooling capacity.